A stretch of sidewalk on Seventh Avenue that could be getting a 10-foot extension. 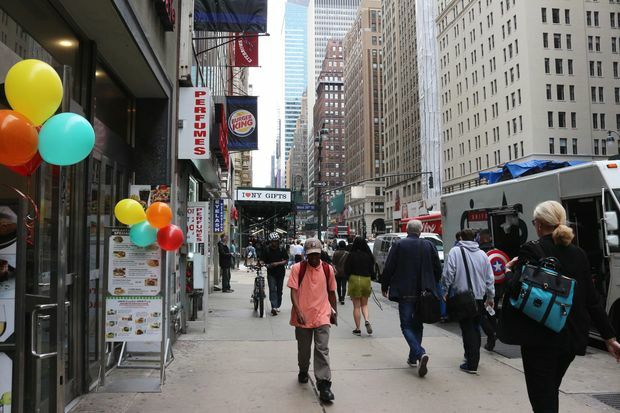 MIDTOWN — The city is planning to widen congested sidewalks for pedestrians walking between Penn Station and Times Square, while closing a pair of busy blocks to vehicular traffic this summer. The Department of Transportation plans to install 10-foot sidewalk extensions and bus-boarding islands along the sidewalk on the west side of Seventh Avenue, between West 34th and 42nd streets, by spring 2018, a spokeswoman said Tuesday. Additionally, the agency plans to close the blocks of Broadway between West 40th and 39th streets, as well as between West 37th and 36th streets, for two-and-a-half-months this summer. The sidewalk extensions and islands between West 34th and 42nd streets would replace a lane that’s currently dedicated to buses and parking, a DOT presentation shows. The DOT also plans to add a number of left-turn lanes along the stretch, as well as installing curb extensions at those locations, according to the presentation. The presentation references a New York Times article citing that portion of Seventh Avenue as one of several overcrowded stretches around the city where pedestrians walk in the street to avoid the sidewalks. The corridor between West 34th and 42nd streets is one of the department’s “Vision Zero Priority Intersections,” with 138 pedestrian injuries having occurred there between 2010 and 2014, the DOT said in its presentation. The pilot program to close two blocks of Broadway to vehicles would start on June 9 and end on Aug. 31, DOT's spokeswoman said. Community Board 5's transportation committee voted in favor of both proposals Monday evening, and the DOT plans to move forward with its plans if it secures the full board's support at a June 8 meeting, the spokeswoman added.